Last year was horrific healthwise, but I'm finally back. 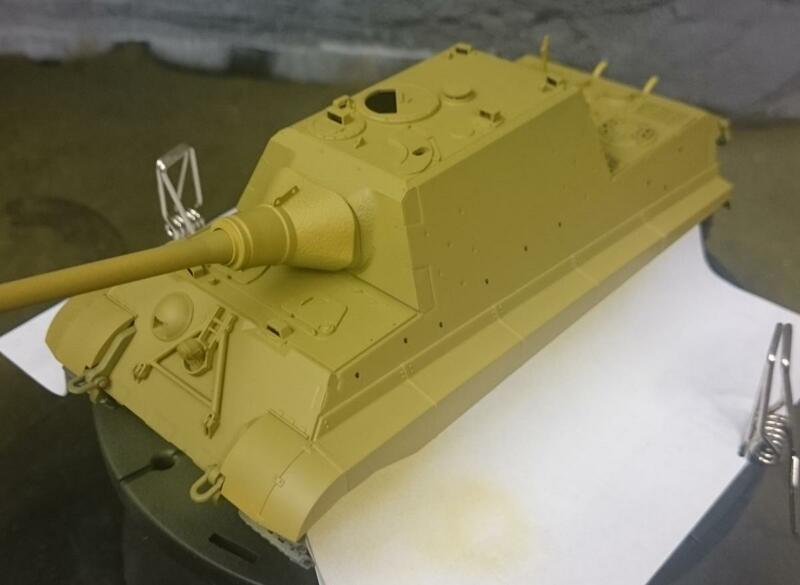 While going through all the cancer crap I thought this would be an easy build, but then I noticed the handles were molded-on blobs, the periscope holes were just empty holes, molded-on tools, etc etc ad nauseaum. So I redid the handles and have some aftermarket tools to go on the back deck. I'm skipping the periscopes as I need to get this off my desk and get back to the Moonliner. Green sprayed. I'm attempting to use a liquid mask against my better judgement--the last time I used it was rather unpleasant. But I think if I can get it mastered, it will be useful. After I pull up the mask, assuming it pulls up properly, I may go back and sharpen up the green and brown edges, but maybe I'll just say its done and move on. Since I like building more than actually finishing the project, I'm trying a new technique to see if it works well (or at all). I'm seeing if the tow cables will stay in place using the flat varnish as an adhesive. So using varnish (at least the Vallejo acrylic) as an adhesive appears to have limited use. Something really light and won't be under any tension/pressure would probably be OK. Despite any trials and tribulations, that came out quite striking! 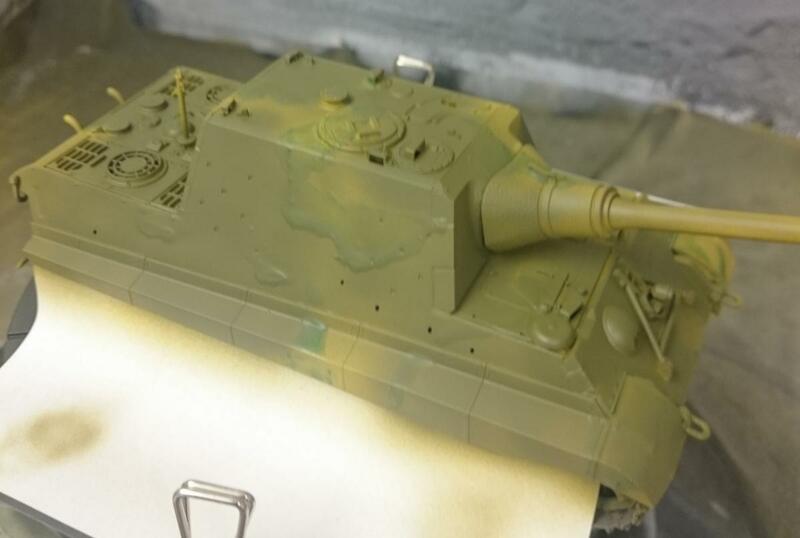 Have you tried using silly putty for masking like that on tanks (or ships)? It goes over bumps and lumps easily and is much easier to apply and remove than liquid masks. Congrats on a great looking build! Looks great David! Nice work! 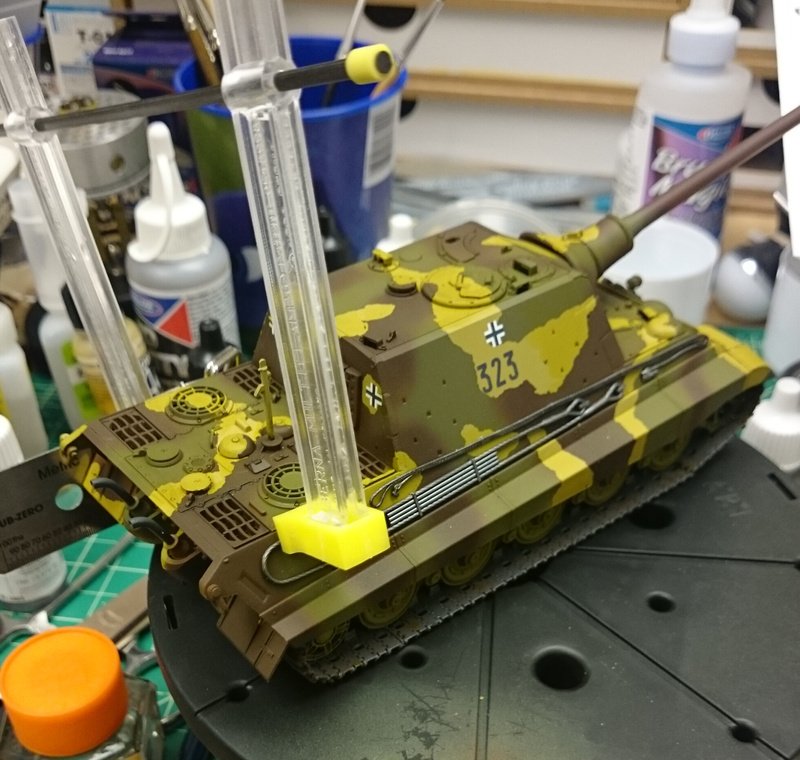 I second Gil's suggestion for4 using Silly Putty; I use it all the time to mask my 1/72 scale armor and I get some pretty awesome three-tone camo patterns out of it. And while cleaning up my work-bench to get to the next project, I found my air-launched and missing shackle. Yay. Not sure if you've worked with the stuff, but BluTack works really well as a camo pattern mask too. Its easier to shape and I find it stays exactly where you want it better than Silly Putty, without requiring as much pressure to make it stick. When you remove it, you just start at one corner and roll it off. I've used the UHU stuff for various purposes--which I assume is similar to blu-tack. I hadn't thought about using it for masking though. Have you had any problems with it pulling up the paint? No paint pulling problems at all. You don't have to push down on it very hard to get it to stay put, and if you roll it off it separates very cleanly. Never tried the UHU stuff though, so I can't be certain that it has the same properties as the BluTack. It made a beautiful Euro I camo pattern on the tail of the CAS F-16 I'm building, with smooth, feathered edges. Damage to the paint came later when I tried applying home-made decals for the first time which had too much varnish on them and made a sticky mess on the nicely painted surface when I hit them with MicroSol. GRRRR!!! Oh well...it was a learning experience...but the BluTack did its job with a minimum of fuss. 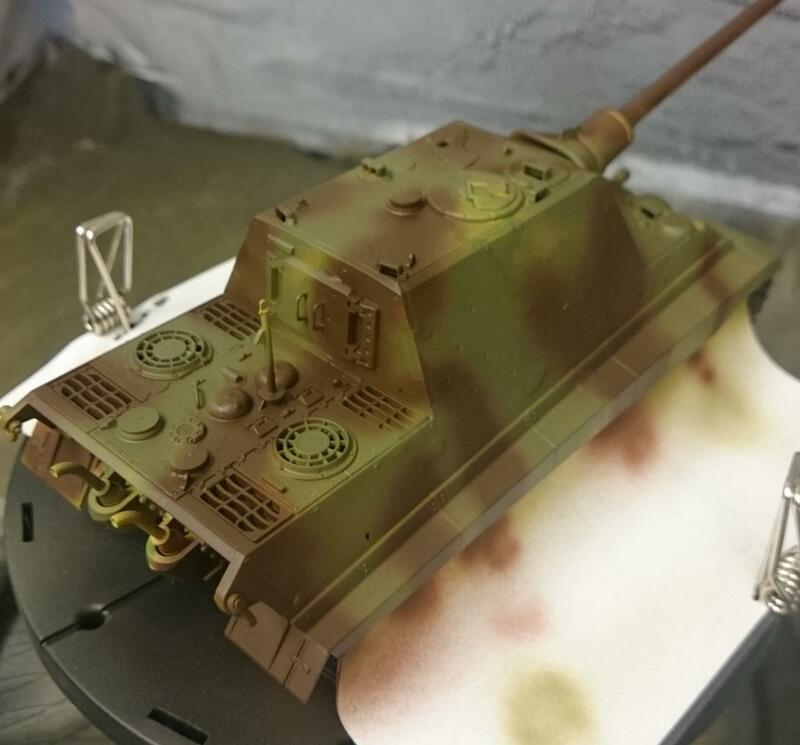 If it hadn't been for my over-varnished decals, the paint work would have been flawless, even though I had even used that crappy Model Master acrylic paint, which tends to come off really easily. Cool, I'll get some blu-tack and see how it compares to the Uhu stuff.